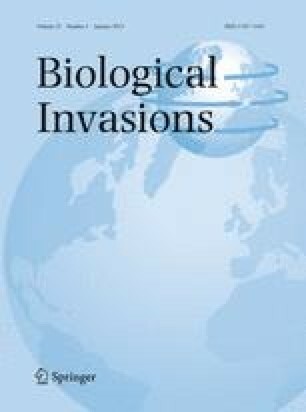 Interactions between macroalgae and their associated fauna are of great interest for marine invasions, because fauna may increase the biotic resistance of a system and macroalgal invasions may cause shifts in faunal composition. We tested for differences in faunal community structure between a macroalgal invader, Sargassum muticum, and several native macroalgae in intertidal pools on both the west and south coast of Portugal. On each coast, we compared the faunal diversity and composition associated with the invader with that of the competing native macroalga(e). On the west coast, the diversity of the fauna associated with S. muticum was equal to or lower than with the native competitor, Cystoseira humilis. Fauna composition differed between S. muticum and C. humilis at both locations, but within each species, no differences between locations were detected. In contrast, the fauna diversity on S. muticum of the south coast varied among locations. S. muticum fauna differed from the fauna of all native macroalgae at one location, but only from three out of seven native macroalgae at the other location. Discriminating fauna species did not show a consistent pattern towards higher or lower abundances in S. muticum compared to most native macroalgae, and species-specific contributions were small. Differences in fauna community also depended on the identity of the native macroalga. In conclusion, the fauna associated with S. muticum differs from many native brown macroalgae, but these differences were not consistent as they depend both on the native macroalgal species and on location. This invader does not seem to have a severe negative impact on local macroalgae-associated fauna. We thank Allison Schmidt, Erik-Jan Malta, Mads Thomsen, Ladd Johnson as well as two anonymous referees for their valuable comments and suggestions on the manuscript. This study was funded by FCT project POCI/MAR/55377/2004, and A.H.E. was supported by FCT scholarship SFRH/BPD/7153/2001 and SFRH/BPD/63703/2009.